Formed in Cleveland, Ohio in 1984, LeVert was a dominant force on the music charts and created a successful blueprint for urban male groups. The trio’s formula of combining soulful ballads and up-tempo beats with catchy hooks produced a dynamic catalog of music to be enjoyed for many years to come. 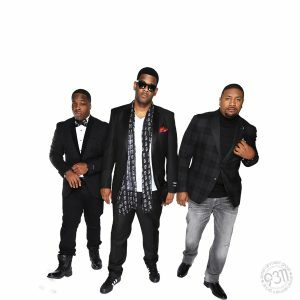 Before adding “Roman Numeral” II to the LeVert brand as in LEVERT II, the original group was comprised of Marc Gordon, Gerald and Sean Levert. The trio hit popular mainstay through urban radio delivering a string of HOT records such as “I Get Hot”, “Bloodline”, “The Big Throwdown”, “Just Coolin”, “Rope a Dope Style”, For Real Tho” and “Whole Scenario”. 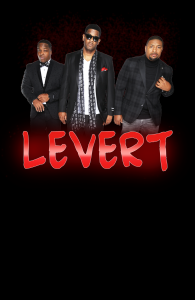 LeVert racked up hit singles such as “(Pop Pop Pop) Goes My Mind”, “Casanova”, “Baby I’m Ready”, “Addicted To You”, which featured in Eddie Murphy’s hit movie, “Coming To America” and “Just Coolin” the first R&B group & song to feature a rapper, Heavy D.
The group’s founding members, Marc and Gerald always knew that music was their destiny and LeVert became its own reckoning. The group would spend long days and sleepless nights in the basement writing songs, recording and practicing their dance moves but LeVert’s road to stardom was not paved with industry hook-ups or doors that magically flew open because of their name, in fact, the group was turned down by every label Gerald’s father, Eddie Levert, presented it to… but the young LeVert group remained focused on making that dream, a reality. Tired of the rejection from major labels, Eddie decided to push the guys independent, so he teamed up with a good friend & former Philly International Records Exec, Harry Coombs and released the first LeVert album “I Get Hot” on Tempre Records. 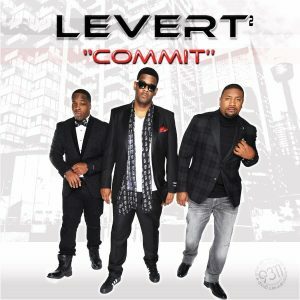 The pieces started falling into place for LeVert, with an appearance on Soul Train with Don Cornelius and their single “I’m Still” on the Billboard R&B Soul charts, definitely helped fuel the fire. Now, those long rehearsals started paying off for young group, booking gigs all over the country, opening up for national acts like “The Temptations”, “One Way” & of course The O’Jays. One gig in particular, in Washington D.C., brought the industry out, and that night was magical, cause LeVert put it down so hard, that Atlantic Records VP, Hank Caldwell, went backstage to congratulate the guys on their impressive show, then offered them a record deal… They were excited about the opportunity but weren’t so sure on how real it was… and then, the very next week, Gerald, Marc & Sean received recording contracts from Atlantic Records, needless to say, they signed the deal and these young men from Cleveland Ohio, made history… They knew that if given a fair look, the music would speak for itself, and so it did- over and over again. The hit making duo of Marc Gordon & Gerald Levert formed Trevel Productions in 1987 and initially signed on the “Rude Boys” who gained tremendous success from their No #1 hit “Written All Over Your Face” and “Men at Large” with their hit single “So Alone”. Whether churning out hits for LeVert or creating hot tracks for other artists, Marc & Gerald had the “Midas Touch”. For more than 10 years, They’ve produced, wrote on or developed other successful recording artists such as Troop, Mikki Howard, Stephanie Mills, The O’Jays & Anita Baker and many others… Marc & Gerald followed the beat of their own drum and left a lasting impression in the hearts and minds of R&B/ Soul music lovers across the world. Born and raised in Youngstown, Ohio, a talented musician, singer, songwriter and Platinum producer in his own right, Blaq Rose, once signed by “Dr. Dre” to Aftermath Records, produced “Hello Darling” and “I wanna Get To Know You” on the “Tell Me It’s Real” and “Something Inside Of Me” on the “X” album for K-Ci & JoJo, all of which, went platinum. Parrice, really kicked his career up a notch by winning the Championship Title on 106th & Park’s “Wild-Out Wednesday”, vocal competition segment on the B.E.T. network.